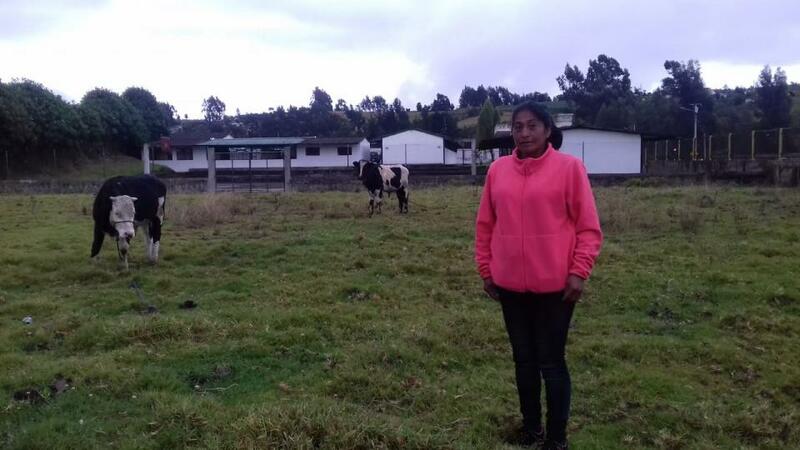 A loan of $1,500 helped to buy a cow, salt, balanced feed and vitamins. Martha is a noble, hard-working, 44-year-old woman. She is single and has two children, aged 17 and 15, who are in school thanks to their mother's tireless efforts. She works raising dairy cattle and also as a day labourer, working hard to support her children and provide them with the things they need. Martha requested this loan to invest in buying a cow, salt, balanced feed and vitamins. She hopes this will improve her income buy increasing milk production. Martha hopes that her children will be able to finish their studies and become professionals. Translated from Spanish by Kiva volunteer Katy Robinson. View original language description. Martha es una mujer noble y emprendedora de 44 años de edad, es soltera tiene dos hijos de 17 y 15 años, ellos se estan educando gracias al esfuerzo incansable de su madre quien se dedica a la crianza de ganado para la producción de leche, también sale a trabajar al jornal de esta manera se esfuerza por dar lo necesario a sus hijos y sacarlos adelante, Martha solicita el préstamo para poder invertir en la compra de una vaca así como también sal, balanceado y vitaminas, de esta manera espera poder mejorar sus ingresos a través del incremento en la producción de leche, Martha aspira a poder terminar de dar educación a sus hijos hasta que sea profesionales. It aims to reach vulnerable refugee populations in an isolated region. This loan is part of VisionFund Ecuador's effort to reach vulnerable populations located along Ecuador’s frontier with Colombia. This region generally lacks access to financial services and is populated by many Colombian refugees seeking asylum from guerrilla warfare. This loan is designed to help these vulnerable populations improve their lives and set up sustainable businesses. VisionFund Ecuador is a microenterprise development fund that supports groups of entrepreneurs who lack access to formal financial systems. The organization works with vulnerable populations, especially women, in the marginalized urban and rural sectors of Ecuador. Its clients work in a variety of sectors including agriculture, artisan crafts and the commercial and service sectors. Kiva lenders’ funds are used to expand the organization’s services to the poor living in more rural parts of Ecuador. Like Kiva, VisionFund Ecuador is committed to poverty alleviation through providing innovative services that are well tailored to the needs of the poor in rural areas. The organization aims to help people in Ecuador who reside in remote areas to establish businesses and improve their living standards. Acknowledging the burden of collateral guarantees, VisionFund Ecuador offers different loan products to groups who are otherwise unable to access financing. Kiva is excited to help VisionFund Ecuador expand its services in rural regions of Ecuador.